Under the direction of editor-in-residence Isabella Burley, Helmut Lang launches The Artist Series, a new project drawing on the brand’s enduring legacy of artistic collaboration. Over the course of the next 12 months, collaborators from Peter Hujar and Carrie Mae Weems to Martine Syms and Andrew Miksys will uncover and recontextualise three cult artworks from their archives as a series of limited-edition posters, T-shirts and products. Here we present inaugural artist Walter Pfeiffer, whose collection launches in October, along with an exclusive look at the stories behind his chosen works. 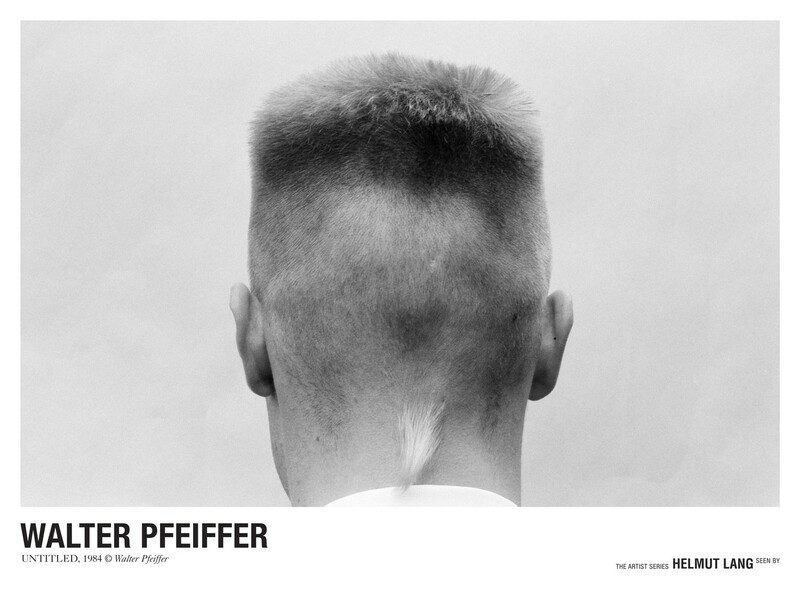 Walter Pfeiffer is recalling the period of his career in 1980s Zurich. “I call them ‘The Budget Years’ but they were also called ‘Golden Years’ too,” he explains. Working cheaply and prolifically, casting Swiss youth from the street or word-of-mouth, the photographs he created at the time – pictured below – were a celebration of spirit, focused on “young, exploding people” finding their way in the world. Revisiting three works from this time for Helmut Lang Seen By: The Artists Series, Pfeiffer shares an insight into the making of each image. “The model told me about a trick he could do. He said ‘look at this and take a photo’. I sighed and pressed the button – ‘Do I have to photograph this?’ Then I forgot it. It was one frame. When I did the Welcome Aboard book I found it. I hadn’t seen anything like it before. Now I’m so happy that I did it. Models can feed you with ideas and you have to indulge them. I’m still like this. You have to be patient and always ready for the moment. They were always training to do something else or doing something else, found from the street or through friends. I like natural models, who haven’t learned to pose. What I like is that they don’t care. It’s always the same age I’m interested in, 20 or 25, these young, exploding people. “His name is René and I did a lot of great things with him, including a play featuring him and a girlfriend of mine. He worked in dentistry and has a print of my lips in orthodontic clay. We did a kissing picture that’s in my book Welcome Aboard – I put the camera on the shelf and that was it. You wouldn’t know if an image was good until days later and that was so thrilling. That’s why I love analogue photography. But this era is gone. I bought the whip from a fairground that had a merry-go-round. I thought ‘I’ll take it!’. I always had props with me and I’d let the models play – you can’t do the same picture with every boy because they are complicated. I’d never used a whip before in my photography. Or since – it never works if you repeat an idea again. I come from the classical and studied the Greeks at school. I’ve always been fascinated by things that last longer, I want my pictures to survive and stay special. “I’d been shooting colour but because of budget I had to print monochrome for my first book Walter Pfeiffer: 1970–1980. So I started photographing in black and white. I call them ‘The Budget Years’ but they were so-called ‘Golden Years’ too. It was the mid 80s. The models came and brought hair clippers, which they used to cut their hair and even mine. The boys dyed their hair blond and went straight up: ‘buzz!’ It was a popular style. In the picture he’s happy, even proud. Another model learning to cut hair did it. I said ‘show me from behind’ and that was it. I don’t think too much, because if I do, it’s gone. You have to train your eyes and mind to be quick. Models would bring me cassettes – ‘you should listen to this!’ – and I’d let the music play. This was the time of nightclubbing. I still have them, but I’m not nostalgic as I like to hear the new, the beat of now. I can always go back to the classics.